How are you all doing today?? Have you been enjoying the releases so far this week at My Creative Time?? I have another fun project to share with you today. 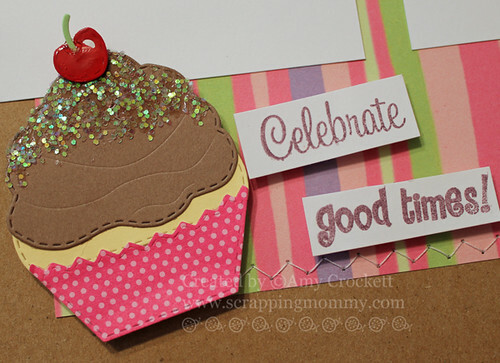 It is a simple layout done with the awesome new Celebrate Good Times stamp and die set. I thought it would be fun to quickly throw together a layout to show you how wonderfully these sets can work with layouts. I used the Celebrate Good Times set to die cut the cupcake and stamp the sentiment next to it. For my cupcake, I added some chunky glitter and also some glossy accents to the cherry. I added a little dimension to the title and cupcake with some dimensional adhesive. I added some stitching and embossing with my Cuttlebug. The title is cut with my Cricut and Phrases cartridge. This wouldn't be a party w/o GIVEAWAYS!With all of our SAMPLES/ SNEAKS this week, Emma likes to do some FUN giveaways! ***All you have to do is leave comments on our blogs! You do NOT have to comment on every blog, BUT if you do, you will just have more chances to win! ***SPREAD THE WORD TO THE WORLD ON FACEBOOK about this release & whatever connections you may have! Let us know on "My Creative Time's" FB page here http://www.facebook.com/#!/pages/My-Creative-Time/364568506334 that you did so! OR you can just tag me in your post! Emma will randomly pick & announce all winners on Friday, May 18th during the blog hop @ 12:01am PST in her video! GOOD LUCK! I just love this set.....I can't wait to share the project I made for tomorrow's blog hop with you, so don't forget to check back!! Now, hop on over to the My Creative Time blog to see what the rest of the design team has done with this awesome set!! So cute, I think I have that patterned paper somewhere. What a beautiful LO!!!! Love the papers and love the new stamps and dies!! Gorgeous! Your cupcake looks delicious! Your layout is just adorable! Love the chunky glitter on your cupcake! Amy ~ What a FABULOUS layout! I just LOVE how you embossed the title and background! Oh that cupcake looks to yummy too! LOVE the chunky glitter! Again ~ you had me at sewing! LOL! Cute LO! I really like the dies in this new set! TFS! I am such a fan of Emma's and all this DT. Another great release and wonderful projects from all. Cute layout! Love the colours! Yummy layout. Love the sprinkles on the cupcake. What a colorful yummy layout just waiting for some pictures...Great job! Very cute layout!! I love the glitter on the cupcake! I love this layout! it is nice and simple but speaks volumes! love the colors too! What a beautiful layout Amy! Love the embossing and patterned paper! Great job on all your projects this week! Sweet layout--I like the chunky glitter on the cupcake. This is a cute layout. Love the cupcake. Great lo. Love the colors you chose. Thanks for sharing and inspiring us with all the great work you do. Love your sweet and cheery layout. Cute layout:) I love the colors you used. Peace, Love, & Cricut Hug's! I love your layout--very cute! Thanks for sharing. Very nice layout, thanks for sharing and for all the ideas!!! Very nice LO Amy, TFS ,The cupcake is too cute! Great layout - love the sprinkles! BEAUTIFUL layout - and wonderful way to use these sets! Love your sewing too! So seriously adorable! Cupcakes and stripes...what could be more fun? What a fun layout! And your sprinkles are so yummy! Thank you for this beautiful LO. Gives me tons of ideas! So pretty! Thx for the chance to win on this hop! oh i love your layout, very simple and cute...gotta scraplift this one! !